JNN 18 Sept 2015 MARIB: At least 14 Pro – President Abedrabbo Mansour Hadi , government troops were killed when a Saudi-led coalition air raid targeted their position “by mistake”, tribal and military sources said Friday. “The air force bombed a gathering of fighters in the region of Harib believing them to be Houthi fighters,” a military source said. 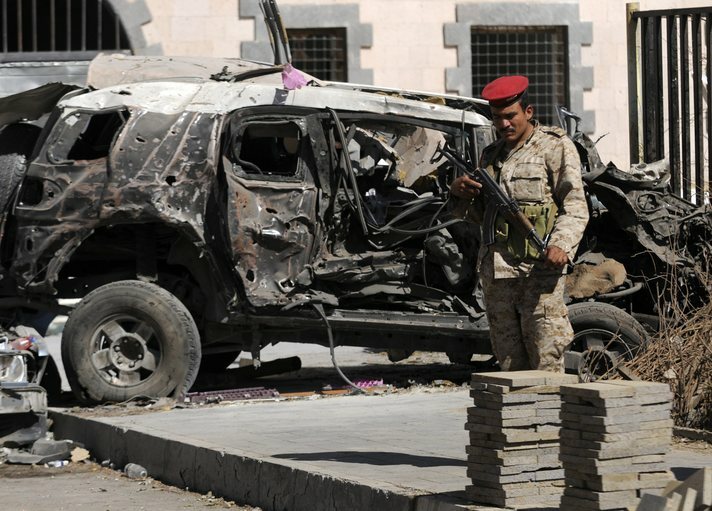 A tribal chief confirmed the overnight strike, saying that those killed appeared to be local tribesmen fighting on the side of the forces loyal to exiled President Abedrabbo Mansour Hadi. Harib is around 80 kilometres south of Marib, the capital of the central province. Loyalist forces, backed by the Saudi-led coalition, say they are advancing on the ground in Marib as part of a major counter offensive against Shia Houthi rebels, who last year in a Major Offensive in Yemen’s capital and other Major parts of the country seized almost Whole of the Yemen . Saudi Coalition aircraft launched a series of raids Friday morning on Civilian positions in the south of the province, military sources said. The United Nations (UN) says nearly 4,900 people have been killed and around 25,000 wounded since late March, while 21 million out of Yemen’s population of 25 million have been affected by the conflict. It is well Known fact that Saudi Arabia and its Allied Persian Gulf States , in clear Violation of the UN Charter and against all Human Rights Organisations Charter , violated the Sovereignty of the Neighboring Country , and Killed Thousands of Innocent unarmed Civilians in its Air Strikes , for which they have no Mandate of Authority . But still the Western Media , UN , and Human Rights Organisations have kept a Mum , as it is in the best interest of Zionist state of Israel and US. This entry was posted in Jafria, Middle East and tagged Abedrabbo Mansour, Air Strikes, Human Rights Organisations, military source, military sources, President Abedrabbo Mansour Hadi, Saudi Arabia, Yemen. Bookmark the permalink.